Here they come: the dinner guests. They weren't invited. Or maybe we weren't invited. We're sitting on a knoll overlooking the Lamar Valley. Water is boiling on our little stove, waiting to be dumped into the dehydrated meal we are patiently waiting to consume. It's a cloudy, comfortable evening, and we've been watching the thousand-plus bison down along the river from afar as they graze their way through the grass and sagebrush. However, they are no longer afar. Over the last half-hour, they have methodically moved north. Slow, plodding, but persistent, their path is increasingly likely to lead to us. We start gathering our things, just in case a retreat seems prudent. Closer comes the herd. Perhaps we'll be dining in the car. But then they turn, following the contours of the hill we stand atop rather than climbing up to join us. The herd has found good forage down below, and they carry on eating, walking, and grunting contentedly. We break out our bowls and eat, too, forgoing the grunting. We could never match their incredibly low tones, anyway. This valley is where the recovery of wild, free-ranging bison began. The story of this species, from prehistory to the woes of the westward march of the United States and up to the present day, is told best by its staggering numbers. Before 1800, it's estimated that 60 million bison inhabited North America, from the Northwest Territories of Canada to northern Mexico and east across the Appalachians into Georgia, Virginia, and the Carolinas. By 1830, their range had retreated west of the Mississippi and their numbers had fallen to perhaps 40 million, still a healthy sum but reduced by one third already. Seventy years later, there were 300 left in the United States. There are no words or numbers missing there. This species that was perhaps one of the most numerous large mammals on the planet was nearly hunted to extinction. In 1901, there were 25 bison counted in Yellowstone. Time was running out. The park took action, bringing in bison from private owners and starting the Lamar Buffalo Ranch, a mile down the road from where we're sitting. Slowly, they raised a herd. 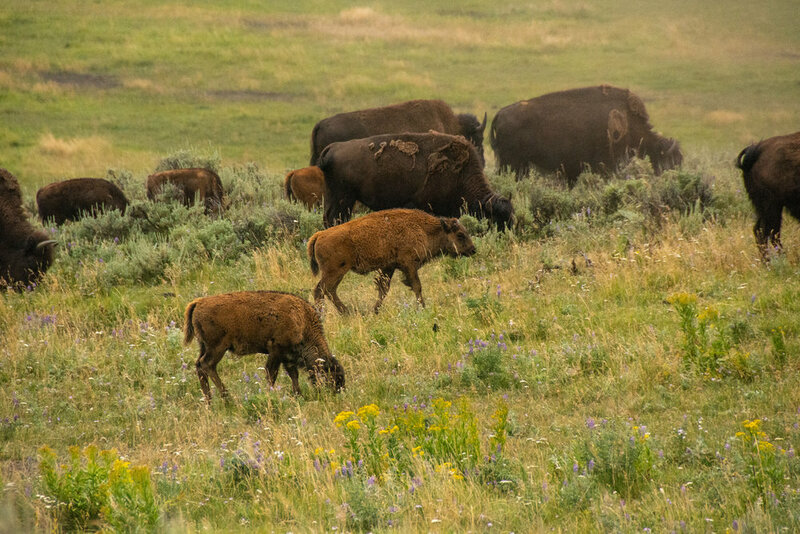 The numbers grew and captive bison were released to roam free with the remaining wild population, helping that herd to grow, too. The results are hard to dispute: today Yellowstone is home to thousands of bison (by some estimates too many for the carrying capacity of the ecosystem, but that is a topic for another time), and bison from the Lamar Valley have been sent to help rebuild populations elsewhere. It's a strange story in retrospect, raising bison like cattle within the bounds of a national park. But it worked. Is every bison we see today truly "wild," as a result? Perhaps not, if you really get down to their genetics and family histories. But would there be any bison here without the ranch, without the park? Probably not. Thankfully, our valley view tonight contains a large, healthy herd of bison. These are the largest land mammals in North America, and they are so numerous in this place that we'd be hard-pressed to get an accurate count. The sun is setting on this day in Yellowstone, but it has yet to set on this species pushed to the brink. Lamar Valley is a renowned destination for wildlife watching. There are grizzlies and black bears, coyotes and wolves, elk and mule deer and pronghorn. We're looking for these animals, too, here in this remnant of the wild continent. Bears and wolves get all the glory, all the spotting scopes and binoculars aimed their way. It can be easy to tire of the bison when you have your hopes up for a charismatic carnivore, easy to look beyond these hoofed survivors. I am making it a point not to discount them. Abundance should not diminish the value of these creatures, the strength they display, the resilience they embody. In Yellowstone, the abundance is what's worth celebrating.